We are stunned by what’s happened in France. Thursday, twelve people assassinated by two French jihadists at publisher Charlie Hebdo in Paris and a policewoman killed elsewhere. Yesterday, the three terrorists killed, along with four hostages. In their assault on journalists, their violence poses a threat to not only press freedom, but free speech fundamental to any democracy. Collectively, like-minded Muslim extremists have bombed newspaper offices, stabbed a Dutch filmmaker, killed writers, and imposed fatwahs, or death decrees, on others like noted author, Salmon Rushdie. More recently, Pakistani Taliban murdered 132 school children, enraging a government where blasphemy laws are imbedded in the legal system. Offended by cartoonists at Charlie Hebdo, these “defenders of the prophet” were part of an underground cell that may number in the hundreds of thousands across the globe, and thus impossible for intelligence sources to keep up with. It would seem incredulous that fervent devotees to Islam, which often dubs itself “the religion of peace,” commit such heinous acts, ultimately epitomized on a larger scale in the atrocities of Al Qaeda and Isis. But they kill each other as well. In Iraq, Sunni and Shiite factions wantonly blow-up each other every day. For too long, we’ve heard very little from the wider Muslim community on the subject. 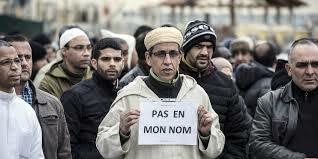 Some Muslims, in fact, have made it known that they’re offended that when such events like those in France occur, they must speak up, indicating a public view of them as a subversive presence. And I can understand their sensitivity about having to continually prove themselves. Still, I think they’re wrong in taking this stance, as I’ll explain in my close. I know from my own contacts with Muslims, particularly in France where I was once a student, just how wonderfully decent they are. My friends came from Iran, Iraq, Jordan, Morocco, and Syria. They were universally kind to me and I was invited to Jerusalem, though I never went. To this day, I rejoice for having fellowshipped with them daily. Religion never separated us, for we shared a common humanity of sensitivity and compassion. In all of this, we do well to remember that being zealous, whether religiously or politically, is inherently dangerous, often giving away to rancor and intimidation, and in heated moments, violence. In short, we can forfeit our humanity. But zealots aren’t confined to any one faith. Religious totalitarians, they represent the voice of Passion, and not Reason. I remember when one Israeli shot more than 50 worshipping Palestinians in Jerusalem many years ago. Here, In the U. S., we have evangelical Christians who have not only maligned homosexuals, but continue to conspire against their fundamental rights. A few have killed abortionists. And then we have history’s testimony as to how bloody Christianity could be, whether in crusades against Muslims, or against one another during the Reformation. As for Judaism, its sacred scriptures–or what Christians call the Old Testament– are hideously bloody, sanctioning genocide. I had thought for many years that Buddhism was spared from all of this, but alas, it just isn’t so, as we see in places like Sri Lanka and Myanmar, where they constitute a majority. But I want to return to Islam and point out features that characterize its scripture, the Qur’an, unwittingly, providing kindling for jihadists to fuel their violence. Make no mistake about it, the Qur’an is foundational to Islamic law, theology, and daily life as Allah’s completed revelation via the angel Gabriel to his prophet, Mohammed. Its opening verses are recited daily in mosques all over the world. Radio and TV quote it daily. Many Muslim children begin early to memorize the entire Qur’an. It has its own style, often employing contrasts, and doesn’t feature a chronological or thematic ordering. Unfortunately, it’s a sacred text subject to the limitations of all written language isolated from the immediate feedback of spoken discourse. Fraught with ambiguity, its classical Arabic is complicated by idiom and dictional features that can allow for multiple nuances, perhaps most notably in a critical word such as jihad often being translated as “fighting,” rather than as “struggle,” its more appropriate meaning. Passages can have a concision, which when isolated from context, obscure the wider intent. This, in turn, often leads to non-Muslims and Muslim extremists employing isolated texts to exploit their views and debasing a noble faith. Nor does the Qur’an exclude “People of the Book, ” (i.e., Jews and Christians) from salvation. In fact, it encourages them to practice their faiths (5:45, 47). We have assigned a law and a path to each of you. If God had so willed, He would have made you one community, but he wanted to test you through that which He has given you, so race to do good: you will all return to God and He will make clear to you the matters you differed about (5:48). Yes, there are Muslim exegetes who take isolated passages to buttress their fundamentalism, denying the full amplitude of other Suras (chapters) and of cultural contexts no longer extant. But such doings aren’t confined to Islam, but a trademark of Jewish and Christian fundamentalism as well. Finding a common ground can only work if we share enough to behave civilly. It goes without saying that though some Jews, Muslims, Christians and Hindus may be terrorists, no religion in the world, much less Islam, teaches terrorism or inspires anyone to kill innocent people. Accordingly, what’s happened in France and happens daily in the Middle East isn’t Islam, but its distortion. This, of course, is why Muslims must come to the forefront and speak out against those bent on hijacking their faith. And many are doing so, along with the French Muslim Council and, here at home, the Council of American-Islamic Relations. Even the Iranian government has condemned this violence. Terrorist ideologues such as these and their wannabe counterparts who pollute Twitter with their hate constitute the true blasphemy and not the slaughtered cartoonists of Charlie Hebdo. This entry was posted in Reflections and tagged al Quaeda, Charlie Hebob, Gabriel, ISIS, Islam, Koran, Mohammed, Quran, religion, terrorism. Bookmark the permalink. Thanks so much for this, Ralph.